Dc in 3rd ch from hook. Dc in next 5 sts, (Dc, ch 1, Dc) in next st; Dc in next 6 st, (Dc, ch 1, Dc) in next st; Dc in next 6 st, (Dc, ch 1, Dc) in next st; Dc in next 6 sts, (Dc, ch 1, Dc) in next st and Dc in last 5 sts. Ch 2, turn. *Dc in each st until you come to the ch 1 space, then (Dc, ch 1, Dc) in ch 1 sp. Repeat from * 3 times. Dc in remaining sts. Ch 2, turn. Dc in ea st to underneath the armhole, work 2 Dc in st under armhole to provide extra room for sleeve ease. Dc in ea st around to other armhole and work 2 Dc under that armhole to match the other side and then Dc in ea remaining sts. Ch 2, turn. Dc in each st and work 2 Dc in st below each armhole on each side for sleeve ease. Dc in ea remaining st of row. Join with Sl St into beginning Dc st. Don’t turn as you will be working in the round from this point on. Ch 2, Dc in sm st and in ea st around. Join with a Sl St into the top of the Ch2 st at beginning. Continue working in rounds until total of 23 row/rounds completed or the desired length of bunting is reached. FO. 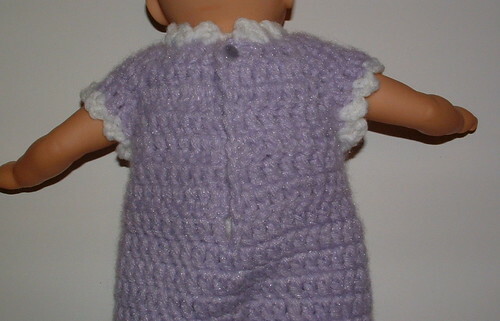 Using white yarn with RS facing, attach yarn at neck at top right hand side (if you are looking at front), *Ch 3, Dc in sm st, sk next st, and Sl St in next st.* Repeat between * around to other side’s top neck edge. FO. 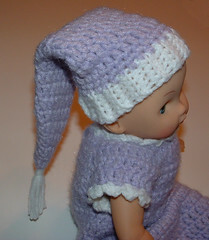 Using white yarn with RS facing, attach yarn at back center bottom, *Ch 3, Dc in sm st, sk next st, and Sl St in next st.* Repeat between * around to beginning. Join with Sl St to bottom of the first Ch 3. FO. Using white yarn with RS facing, attach yarn at underarm, *Ch 3, Dc in sm st, sk next st, and Sl St in next st.* Repeat between * around to beginning. Join with Sl St to bottom of the first Ch 3. FO and repeat for other sleeve edge. For drawstring tie, chain about 18 inches long. Sl St in 2nd ch from hook and in ea st back along chain. FO and weave the ends under up the chain. I used a little fray glue to secure the ends. Starting at the center, weave the drawstring tie in and out through every other Dc row and end back at center. Pull up and tie a bow at center front. Sew button at edge of back opening just below the white trim. I just use a stitch at the edge of the purple for my buttonhole. 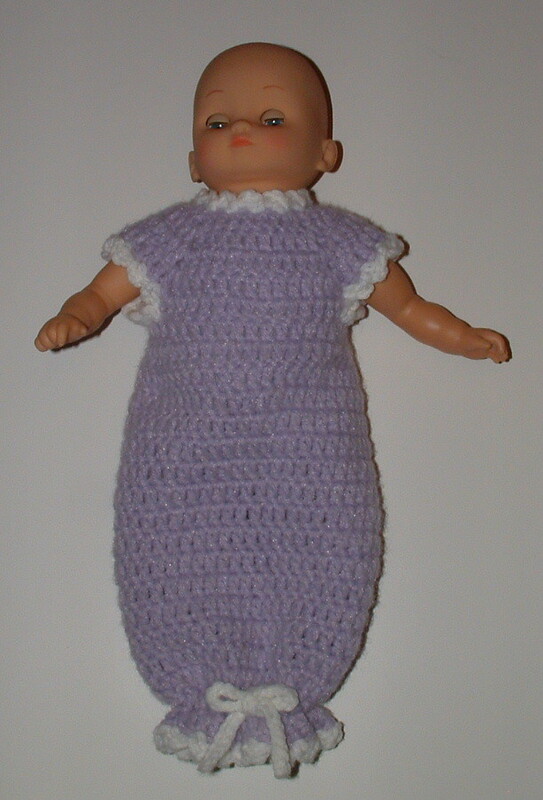 I’ve just recently picked up crocheting again, and looking for Barbie doll patterns i found you!!! i have also recently discovered PLARN! and all my gifts this year are in plarn shopping bags….BTW – drycleaning bags make an interesting plarn…hahaha. thanks for interesting patterns and ideas! Abigail — I sent you an email with more details. I respond to all questions on my patterns no matter how long ago it was posted. I hope you figured out row 5, if not please email me back.